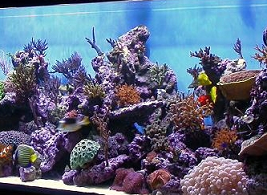 Marine Live Rock placed in saltwater tank actually functions as a good biological filter. It will provide a platform to host the growth of beneficial bacteria while at the same time contributes towards aquascaping. The nitryfying bacteria will basically help to convert ammonia into nitrites and nitrates which are less harmful and thus this will enhance the water quality, making it more suitable for your saltwater fish. Unlike tank undergravel filter which may clogged up over time, these marine live rocks does need the same routine maintenance cleaning to be carried out at all. Current practice by saltwater aquarium pet owners is to fill at least one-third of their marine tanks with this type of setup to create a well-balanced natural ecosystem that will be able to sustain itself. Other than the benefits mentioned above, having marine live rock will also provide shelter for your fish and invertebrates. With the natural-looking surrounding, it will help towards getting newly introduced fish acclimatize faster to their new aquarium tank environment and they will not be easily stressed out as well. Apart from that, growth of algae on the surface of live rock could also provide substrate for proliferation of worms and copepods, which are actually source of readily available live foods to be consumed by your marine fish. Other than that, rocks will also act as a base for formation of soft corals, which will definitely enhance the overall natural beauty of your aquarium. Buying your choice of live rock should not be difficult, as it is readily available in established local pet stores. Before making your purchase, it should be a good practice to check the source of supply and also confirm with the seller whether these rocks are “cured” or “uncured”. Although priced much cheaper, uncured rock will basically mean you will need to commit extra hours cleaning the rock of decomposed materials and bearing with the stench before you can place into your aquarium. However, for cured rocks, all these cleaning processes have been done for you and therefore, all you need to do is to conduct a short rinse and these cured rocks can then be easily introduced to your marine tank. There are also special request types of live rock harvested from different location in deep sea but be prepared to pay heavy price to acquire it.